Pacific Hoists introduces a new range of powered hand trucks to its materials handling products portfolio. The Makinex powered hand truck PHT-140 is a universal materials handling solution that enables one-person operation to safely lift and load small equipment or bulky goods weighing up to 140kg. It provides a quick and easy alternative to using a forklift or tailgate loader for small loads. Makinex powered hand trucks find application in workshops, warehouses, factories, depots, distribution companies, and hire and rental yards. Featuring a powered lift via a 12V 25 Amp linear actuator, Makinex powered hand trucks are easy to operate with the lifting arm reach controlled by the user lifting or lowering the handles and arm height controlled via a simple thumb switch. 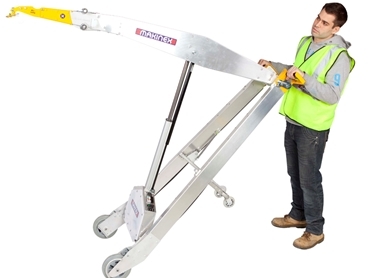 This unique design allows a single operator to safely lift and load directly into vehicles (trucks, vans, utes and cars) or to place equipment and small loads on bench tops. Makinex powered hand trucks eliminate awkward and dangerous one- or two-person lifts and reduce the incidence of back and other injuries caused by heavy lifting. Lightweight and easy to manoeuvre, Makinex powered hand trucks can be folded down flat after use for easy transport and storage. Makinex powered hand trucks come standard with a hook attachment for lifting, moving and loading small equipment and machinery fitted with a lifting eye such as water pumps, generators, air compressors and plate compactors. An optional fork attachment is available for lifting, moving and loading small pallets and skids.